While he may not be the prime example of “polite society” in the eyes of postbellum America, Tony Montana redefined drug dealer chic in 1983’s Scarface with his numerous sharp suits and incomparable swagger while wearing them. For his meeting with Sosa and subsequent poolside rendezvous with Elvira, Tony wears a light cream suit with a thin, dark pinstripe. He pairs the suit with reddish clothing, including a red shirt and handkerchief and cordovan belt and shoes. The white and red mix is pretty commonly seen with Tony, including his white wedding tuxedo and accompanying red bow tie. The suit jacket is double-breasted with a 4×1 button front. The peak lapels have a concave breakline and a slanted gorge, adding an exotic flare and stretching the lines up to the padded shoulders. The white horn 3-button cuffs match the four white buttons on the front of the jacket. The jacket has a ventless rear, but it fits well enough that Tony doesn’t look too tightly dressed when he fastens the front. Though he isn’t one for etiquette, Tony properly keeps the jacket buttoned when he is standing and unbuttons it to sit down – although he leaves it open when getting heated during his discussion with Sosa. Tony heads from a business meeting directly to a bar full of Scotch. If he wasn’t an American before, he sure is now. There are straight jetted pockets on each hip and a welted breast pocket, where Tony rakishly places his display handkerchief. The handkerchief is red silk with many small white polka dots throughout. It hangs out of the pocket more than the traditional pocket puff, and – like the rest of his outfit – wouldn’t garner much respect in old-fashioned sartorial circles. Tony avoids the faux pas of matching it exactly to his solid red shirt, although it is still very flashy and should only be attempted by someone with enough chutzpah to defend himself either in words or with fists. Note the contrast between F. Murray’s purple suit and Pacino’s cream suit. F. Murray only looks ’80s-tacky while Pacino looks like he could be fashionable tacky in any decade. While we’re on the subject of his shirt, Tony wears a dark red silk shirt. Everything about the shirt and the way he wears it screams ’80s drug dealer, but that is exactly what a guy like Tony is going for, unlike the more restrained windbreaker and linen shirt chosen by Sosa. Scarface receives the official David Hasselhoff seal of approval. The shirt has a luxuriously large fit, further enhanced by Tony’s refusal to button it up any higher than his xiphoid process. The red plastic buttons, should they be used, button on a placket. The sleeves fasten with buttoned cuffs. This suit’s trousers are flat front with a low rise. Tony never removes the jacket, so we only see the slanted side pockets, although his suits typically have a right rear button-through jetted pocket, so we can expect the same with this suit. He wears a cordovan leather belt with a small rounded brass single-prong buckle. A fine way to start off your summer. The trouser bottoms are plain-hemmed with a slight flare and a short break, showing off his shoes and most of his socks whenever he is sitting or lounging. Tony’s oxfords are cordovan leather to match his belt and have a raised heel to enhance Pacino’s 5’7″ height, giving him a slight edge over Michelle Pfeiffer but he still looks diminutive next to the 6’2″ Paul Shenar and even 5’11” F. Murray Abraham. Despite his height, Tony’s presence is commanding and the difference in size is hardly noticeable. Tony wears a pair of dark red silk dress socks, both matching his shirt and highlighting the reddish leather of his cordovan shoes. Proud of his constantly growing wealth, Tony wears an abundance of jewelry throughout the film. One of the most noticeable is his collection of gold Omega La Magique watches, which he seems to own a variety of to match every suit or shirt in his collection. With this suit, Tony wears a La Maqiue on his left wrist with a gold expanding bracelet, gold rectangular case, and small round red dial. On his right wrist, Tony wears a stainless link bracelet. Some men enjoy birdwatching; others enjoy informant-being-hanged-from-a-helicopter-in-mid-air-watching. And what criminal kingpin would be complete without his rings? Tony sports both of his gold rings on his right hand, with a diamond on his ring finger and a square-cut ruby on his pinky. Note Tony’s eventual killer, standing obediently behind him as he negotiates with Sosa. Oh, and spoiler alert – Tony dies. Tony also sports two yellow gold necklaces. The largest one, closer to his neck, is appropriately known as a Cuban-style chain. The thinner one, further down his chest, is a simple gold rope necklace. 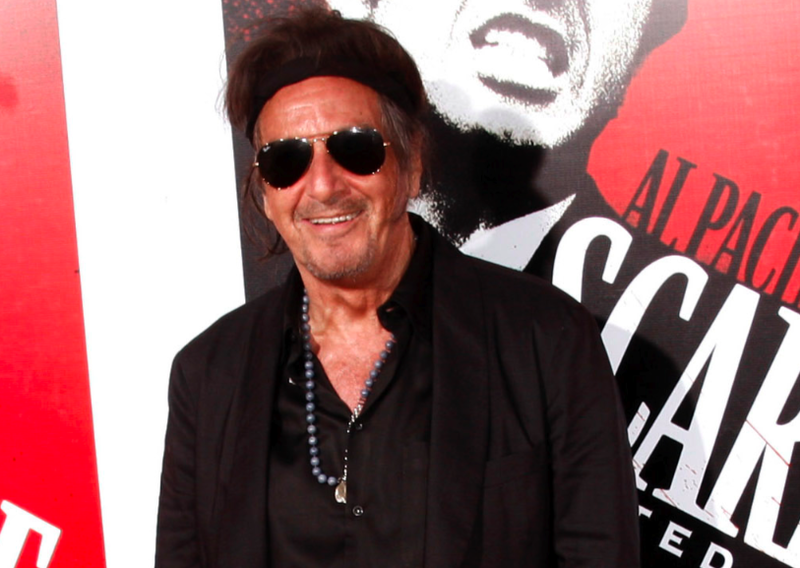 Apparently, Pacino has a thing for necklaces. When he returns to Miami, Tony dons a pair of black sport aviators, which were all the rage during the ’80s. I remember my grandfather wearing a pair, and I’m sure many of your fathers had a pair as well. Tony’s glasses were black with teardrop-shaped acetate frames and amber gradient lenses. You can pick up a similar pair at zeroUV for the snazzy price of only $9.99… or just raid your grandparents’ house. No ’80s man was complete without his plastic sport aviators. 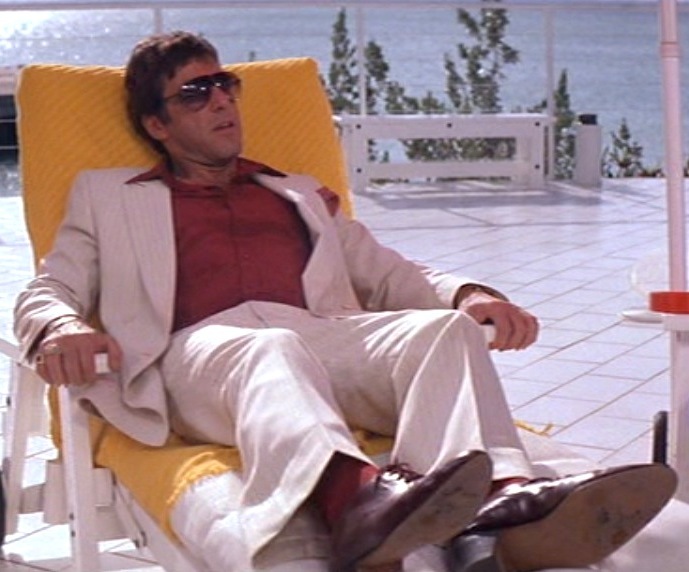 Tony wears quite a few white suits in Scarface, including this cream pinstripe suit, his white wedding suit, and another pure white three-piece suit when stopping at home to visit his family. He avoids the pastels that defined the era’s extravagance, although some of his blue suits begin to approach Miami Vice territory. May your Memorial Day be full of copious amounts of J&B on the rocks, served by a swimsuit-clad early-’80s Michelle Pfeiffer. If you’re familiar with “business casual”, this variation of “drug dealer casual” will advise you how to dress for your weekend jaunts down to Colombia. If you do go for this look, try and show some modesty with your shirt buttoning. If someone wants to see your chest that badly, they’ll accompany you to the beach. Check out the deluxe DVD gift set that includes both this film and the Paul Muni 1932 original. He was briefly released in 1988, and spent 69 days outside, but was soon arrested again for conspiracy to commit robbery.